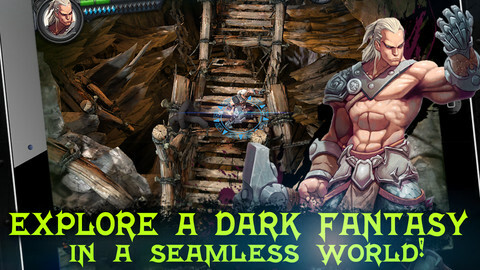 Are you ready to take on the forces of darkness in this sprawling combat game? 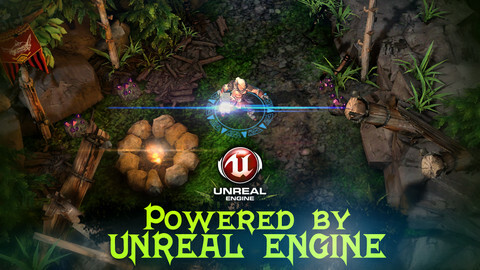 Until we can sample the delights of games like Diablo 3 or Torchlight 2 on the go, we're always interested in taking a look at a new game that lets us crawl through the over and underworlds. Crescent Moon Games' Wraithborne appears to offer us just that, with a story that takes in legends of werewolves, dark forces, and a Witcher-esque character destined to rid the world of this perpetual darkness. The controls are simple. To the left of the screen you have a virtual joystick for movement and there are three combat icons on the right. The first is a faster, lighter attack, the second is a heavy attack and there's a shield which charges up when you hold the icon down, offering precious protection for the hero. These are pretty competent in combat as you slash away at the approaching enemies with blood-spurting fury, pulling off combat button combos for especially devastating moves. 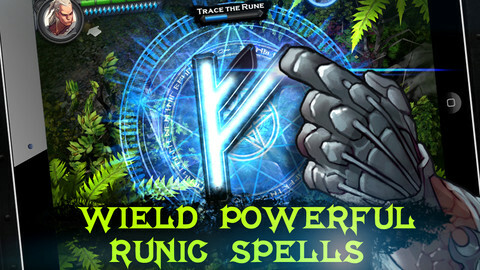 As well as this feisty melee combat, you can take advantage of rune powers which add a little extra flair to proceedings. In a nod to games like Black and White, you need to trace out the shape of the runes that you slowly unlock on the face of the screen. The effort and care of succeeding at these little challenges are well worth it, and you're rewarded with magical meteor strikes, or life-saving healing powers. For the most part these controls are solid, although we did find movement within the game a little slow, perhaps to accommodate the loading of what are some impressively lush environments. Grim forests and stonework buildings are blended together with remarkable touches of detail in this Unreal Engine-powered title. The music and audio is considerably sparser than the visuals, but we can be generous and admit that it adds a great deal to the atmosphere. As well as exploring these beautifully crafted environments, taking down the ninjas, thugs, and dark forces of the world so as to complete mission objectives, you'll also have to deal with certain Challenge sections of the game, where wave after wave of increasingly dangerous creatures spawn all around you before a bloody fight for survival commences. It's a great way of throwing both challenge and variety into what could otherwise have become a fairly repetitive combat crawler. Wraithborne is a very solid combat action game that will give no small amount of satisfaction to fans of the dungeon-crawling genre. There are a few rough edges in the framerate and movement speed which we'd like to see smoothed out in a future update, but this is a very competent title that will bewitch any combat RPG fan. What's Hot: Beautiful environments and a solid sprawling combat game. What's Not: The framerate can occasionally chug a little and we'd have liked zippier movement.